I scoff at the curse with aptly named and lovingly made socks. These are really great, I've got to say. 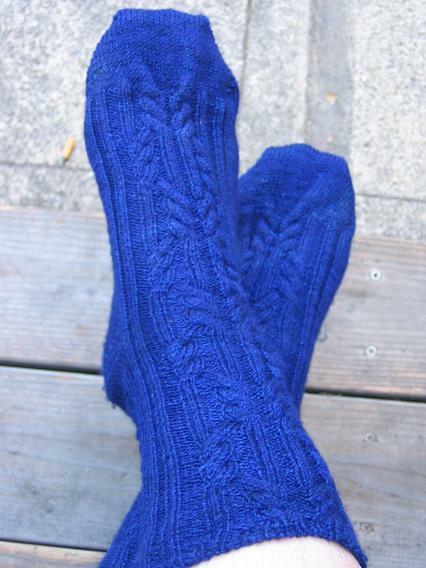 The ribbing is interesting with the cable detail, stretchy in a good way (these are for a 9.5" wide foot, mine is 8.25" and still comfy (i realized i like a slightly looser fit foot in handknit socks)-- the 9.5" foot says they fit like a glove. Alice's sizing and negative ease calculation seems right on as far as my "medium" sized pair went. I used the "cabling without a cable needle" method and it seemed to fly-- I was always put off by "learning" it since, well people always say they "learned" it and I never wanted to take the time to master something new since I knew how to use a cable needle :) I'm glad I did, I'll be using it from now on... just take a look at Wendy's link! If you've cabled before, there's nothing to "learn" really. 1) It seemed to have a lot of twist in it, not like the yarn was overly twisted, but that the nice looking and soft yarn kept twisting back on itself throughout the skein and knotting on itself at times. I noticed this in each of 4 skeins (I have an "on the go" sock I'm knitting in one of the variegated colorways). It wasn't where I had to let the work dangle and untwist (just once), but the twisting seemed almost odd since the yarn itself wasn't overplied. Maybe I'm thinking about this too much, reading the spinning books lately. 3) The yarn feels great. It makes a thick, sturdy feeling fabric on US 1's at 8 sts/inch, and for those who like ironwear socks, a US 0 would get an even thicker result. 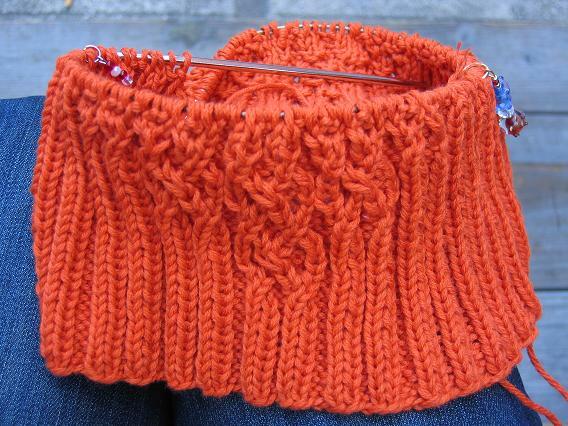 I think it would hurt my hands to knit it tighter than a US 0, but that's just me. I like the 1's, and I also like how "heavy" these socks feel-- perhaps the cabling and ribbing makes the sock feel heavy for its size, but in hand they're soft and squishy. The cables look great in it as well, good definition on and off the foot. I ran out of yarn :) I had knit the first with 6" to spare, but I had to cannibalize it as I ran short on the second sock. It was anathema to me, undoing the bindoff of the first, but had to be done. Each sock now is knit to row 4 of the cable pattern and have 4 rows of k1 p1 rib before binding off using the graft off top/faux kitchener bindoff I linked in my last post, with a 10.25" foot and a 7" cuff measured from where the cabling starts atop the heel. The k1 p1 rib looks a little short to my eye, but not so bad as to have me rip out a cable... I like ending it on that "closed" part of the panel. Like I said, the cabling and rib is tight enough to not really rely on the top k1p1 to keep it up and in place on the leg, its more of the aesthetic. Still love em though. I was able to get gauge on US 5's (I got it on 6's too, but weirdly the fabric was just a bit drapier and I didn't think I liked it as "open" as it felt). The 80cm/24" needle was fine for me-- the body size I'm knitting is 24" around so I started on 16" and it was just too much bunch. This way's not bad at all (I really didn't want to buy a 20" circular). I am knitting the "2" (smallest) size, but am adding length to it-- once again I'm shocked that my genepool has produced a tall, skinny kid. I worked 1.5" rows of plain in-pattern (row 1 of chart) rib before starting, looks like I'm about 20 rows in the chart now. One thing, maybe its me: I printed the body charts like a good girl and taped them together, but they don't line up evenly! The right chart is 2 squares taller than the left (over 100), so it minutely shifts upwards and I have to untape and retape as I move up the chart. So irritating, as the tape seems to pull up the print. More later... trying to decide if I want to cast on for another sock and knit the sherwood sweater at the same time or not. We'll see! :) Have a good week yall. It's a plague! A curse! An epidemic, even!! The Yarn Gnomes are out in full force, snatching bits of yarn from the loose end of the skein while we sleep. Li'l buggers! You know, I tried cabling with a cable needle exactly once. Not for one whole project...I mean I used the cable needle one time. Without spouting another arm, I don't think there's any way I ever would have gotten the hang of it - there is no other way BUT the cable-needleless cable method! Oh those socks are gorgeous! I may have to put them on my list of "to make socks". The orange for Sherwood is coming out great. 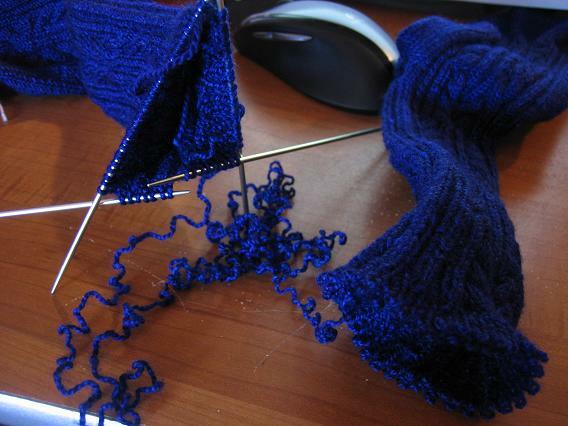 What the heck - it's Socktober - start another sock!!! Love the BF socks! For some reason I thought Toasty Toes was DK or sport weight, so it's good to know it has normal sock yardage. Suckage on the running out of yarn part. I have pretty short feet, so I haven't had to deal with that yet. Phew. Sherwood is going to be so cute! I wish I had wee one, just so I would have an excuse to knit it. Oh, they look great. I'm glad to read that you didn't find them too difficult, and I even bookmarked the pattern for myself, despite the fact that I have been resisting the toe-up thing just out of a fear of trying something new, I guess. These socks are so lovely, I may have to rethink my position on that! 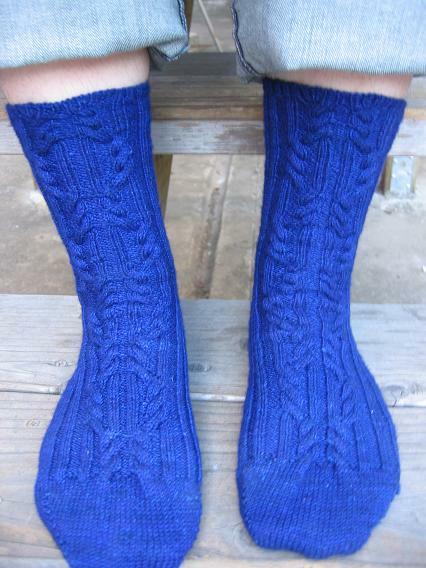 I think I may use my cashmere sock yarn for a pair of BF socks. Or at least that's what I'm leaning to at the moment! What curse? There is nothing cursed about those BF socks. They look so nice and cozy. You must cast on for more socks right away. You can't have naked sock needles during Socktober. I wonder about the resist - have never seen that before, either. Do you add anything like dishsoap or synthrapol as a wetting agent? Very awesome socks! The color is so rich! What color were they before you over-dyed them? I love the Boyfriend socks! They turned out so well. Sherwood is going to be fantastic too - orange is awesome. Add cables, and it's the best. I think you broke the cure indeed! Those socks turned out fantastic! 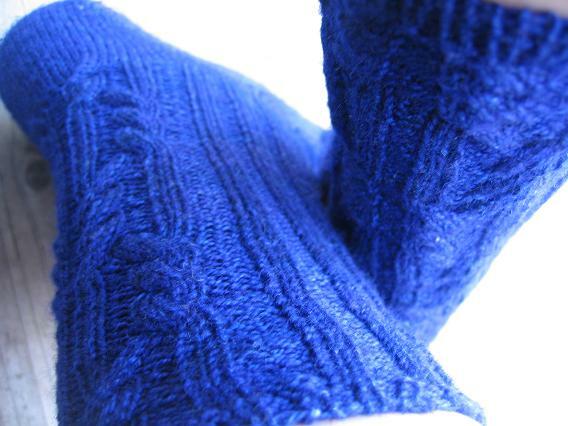 I love the overdyed color, it's perfect for that cable pattern! Sorry you ran out of yarn! I love alyson's idea of the yarn gnomes!! Too funny! Wow I love the blue! I had a skein of Koigu once that kept twisting back on itself. It made me think of a snake eating it's tail. There's a nice visual for you. They look great. That stinks about running out of yarn, though. 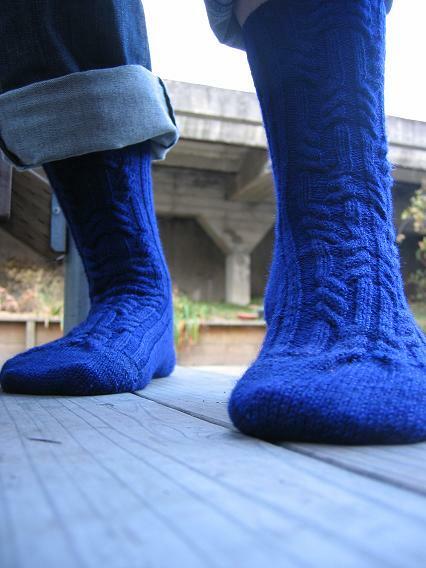 Funny enough, the socks I'm trying to knit up at the speed of light are, in fact, boyfriend socks. Fantabulous! That deep blue is extraordinary. I could live in that colour. Interesting that you don't need a top rib ... it's a look I like in sweaters, but socks just seem to "need" a bit of rib. Welcome back! Love those BF socks! really nice job with the cables. I keep trying to learn that no cable needle thing, but I have yet to master it! oh, and not that it's any of my beeswax or anything, but who is your daddy? I think Mr S will be getting some boyfriend socks from the Gems I have in my stash. Can my husband of 8 years qualify as a boyfriend? Thanks for the link to that pattern - I've been searching for a pattern for a solid color - these are perfect! Love that blue color - so vibrant! Those socks are gorgeous!! Definitely on my "to do" list. I even think I have the yarn for them. Time to go stash hunting. I love the socks! Take that curse!! They socks look fabulous! Handsome enough to make any dear man hang around!! great BF socks! and Sherwood... talk about wild orange! I printed this pattern out after your very first progress pic. They came out just amazing! The socks look really great! Fabulous! Now that the pirate hat is finished, I was looking for a pair of socks to knit up with Lorna's Laces. You popped in and lo and behold, I now have the boyfriends socks pattern printed to cast on this afternoon. Thanks! Yours look totally awesome! I agree that boyfriend/girlfriend/friend/whatever works. Thanks for telling me about this pattern - and for showing your own wonderful work. I think I'll have another stab at needle-less cabling now I've read your post on the socks - even though the whole concept does strike me as worryingly like parachuting without a parachute.